I decided to add numbers to the titles of these posts. I might go back and change the older ones when I'm avoiding something that's actually important. The new-to-me word is a somewhat obscure terms that John McIntyre might select someday for one of his "In a word" columns. The word is pelf, which I ran across in one of those fancy magazines that we have in big stacks around here. Pelf is defined as "money" or "wealth," but has a connotation that the riches were acquired "by reprehensible means," to quote one dictionary. The example sentence I found it in talked about "Trump family pelf." It's an old word, which might not be surprising. We got it from French in the Middle Ages, and its first sense was "stolen goods" or "booty, spoil." So we can see where the negative connotation came from. Update On Twitter, Edward Banatt notes that pelf is related to the verb pilfer. Because I was curious about why I had apparently not seen this word before, I looked in the COCA corpus to see how common it is. Not very: as a noun (as opposed to a proper name), pelf appears 5 times out of 560 million words. And it's been on the decline since the 1800s. Perhaps circumstances will make the term newly popular again, who knows. Unexpected etymology comes this week from a conversation we had at work the other day. We were talking about ancient Greece for some reason, and colleague Jay said, "People from Attica are 'Attic.' So where do you suppose the word for the storage space comes from?" Well. This is why you keep bookmarks to dictionaries in your browser. 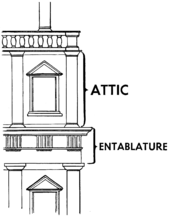 Way much to my surprise, the name for the area under your roof—sometimes also called the garret—is in fact related to the Attics, the people whose capital was Athens. The name of this small story came to be applied to the space that it enclosed, and then was generalized to mean any space directly under a roof. So we go from classic architecture to the place to shove your Christmas decorations and unused sports equipment. What do you suppose the ancient Greeks called their version of the space for all that extra junk?